The first mention of the word challah is found in the Bible in Numbers 15:20. God instructs the Israelites to “offer up a “cake” (challah) of the first of their dough for an offering to the Lord”. 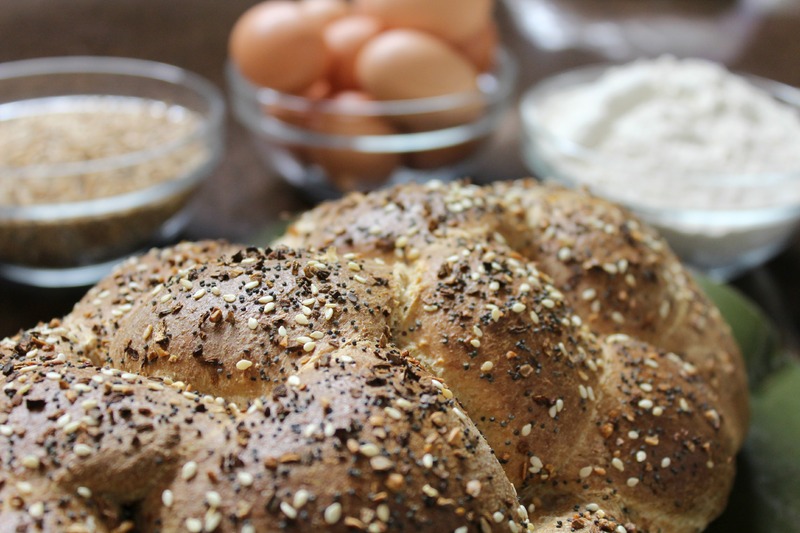 Today, challah typically refers to the entire loaf of an egg-enriched yeast bread traditionally eaten by Jews on Shabbot (the Sabbath), ceremonial occasions and festival holidays. On the Sabbath, two loaves, usually braided, are placed on the table to represent the double portion of manna that was provided by God for the Israelites in the wilderness to remind them that God will provide even if they refrain from working. The braided loaves are a symbol of love, peace and unity. As one goes through the 6-day work week our efforts are directed outward. The idea of the Sabbath is one of unity, absorbing the blessings of our outward week’s work and directing them inward into our homes and lives. The 6-strand braided loaf beautifully represents the intertwining of all the diversity in our lives throughout the week and bringing them together in unity and harmony. So often today when we hear the word Sabbath our thoughts turn to a legalistic list of “don’ts” – don’t work, don’t travel, don’t have fun. Yet, truly experiencing a Sabbath, you will find it a great revelation that it is a day of refreshing and many “do’s” – do spend time with friends and family, do relax and read, do enjoy a slower pace, do join the your community in worship and fellowship, do nap without feeling guilty about not doing work, do enjoy a day of rest. A common greeting on the Sabbath is Shabbat Shalom, a peaceful Sabbath. Most often we think of peace as simply the absence of conflict. Shalom actually means to restore in the sense of replacing or providing what is needed in order to make someone or something whole or complete. It means having no deficiency. In reality, God made the Sabbath for man (Mark 2:27) so that we could cease (rest) from our work on the seventh day as He did so that we might be restored, renewed and refreshed. Rest from our work may take on many forms, but most importantly it allows us to simply enjoy life. Perhaps we would look forward to our work week more enthusiastically if we paused to enjoy a Sabbath rest. A rich, soft textured bread, perfect for any occasion! In a large mixing bowl, combine water, oil, honey eggs and salt. Gradually stir in 3-4 cups of the flour forming a thick batter. While continuing to mix, sprinkle in the yeast. Add the rest of the flour a little at the time to form a soft dough. Let knead 8-10 minutes. Cover and let rise until double. Dough may then be divided to make 1 large braided loaf or 2 or 3 smaller loaves. Brush loaves with beaten egg mixture and sprinkle with seeds as desired. Let rise until double. Bake at 350 degrees for 20 – 30 minutes depending on the size of the loaves or until the internal temperature reaches 180 degrees. There are several videos on the internet using several methods to get the same result. I found this method to be the simplest to do. 1. Divide the dough into 6 equal pieces and roll each piece into a rope about 12 inches long. If sticky sprinkle with a little flour or add oil to your hands. 2. Connect the tops of each rope together, pressing firmly to secure. 3. Take the far right rope across the top, all the way over to the left forming a “T” with the other ropes. Do the same with the far left rope taking it across the top all the way over to the right forming the other side of the “T”. At this point the ropes should look like a 4 legged creature with outstretched arms across the top. 4. Now take the 4 ropes that are the “legs” and separate them down the middle – 2 to the left and 2 to the right. 5. Starting with the top left part of the “T” – bring it down the middle of the 4 separated ropes. Now take the rope that is on the far right (not top right) across the top, all the way over to the left replacing the left part of the “T” that was taken down the middle. 6. Separate what is now the 4 legs – 2 to the right and 2 to the left. 7. Take the top right part or the “T” and bring it down the middle of the 4 legs. Now take the far left rope across the top all the way over to the right, replacing the right part of the “T” that was taken down the middle. 8. Separate what is now the 4 legs – 2 to the right and 2 to the left. 9. Repeat the process again with the left part of the “T” then the right part of the “T” until the ropes are too short to continue. Tuck ends under to fininsh. 10. Carefully place on prepared baking sheet. Brush with egg wash and sprinkle with seeds as desired. 11. Let rise and bake as directed.